On Saturday, October 4, 25 members of the Branford Land Trust Board of Directors and Advisory Board met for an all-day educational retreat. 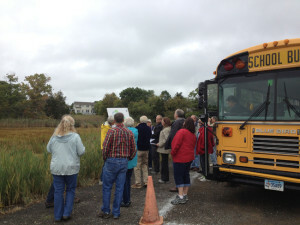 In the morning, former BLT president Bill Horne led the group on a 2-1/2 hour bus tour, highlighting Land Trust properties across town including the Short Beach Preserve, Sybil Creek Marsh, Jarvis Creek Preserve, Van Wie Woods, and the Pisgah Brook/Supply Ponds Watershed. The group continued their day at Branford Fire Headquarters. Following a break for lunch, the organization’s eight committee chairs led a lively group discussion about Land Trust activities, challenges and goals. Everyone agreed it was an interesting and useful day that gave a great overview of the organization for new and seasoned volunteers alike. The day was organized by BLT president Amos Barnes, board member Jen Payne, and past presidents Bill Horne, Meg Kilgore, Joan Merrick, and Bill Reynolds.